Last Days: Famines and floods will increase in many areas. Diseases and epidemics will become worse. > epidemics will become worse. After studying weather records back to 1900, the United States government's leading scientists and climatologists compiled a list of the world's top weather, water and climate events of the 20th century. Dozens of National Oceanic and Atmospheric Association (NOAA) experts contributed to a U.S. and a global list of wild weather incidents that were noted for their atmospheric marvel or impact on human life. From floods, typhoons, hurricanes and droughts to heat waves, tornadoes, winter storms and blizzards, the weird weather was measured by the event's magnitude, meteorological uniqueness, economic impact and death toll. "The lists demonstrate the wide range of weather calamities that impact much of the world's public, and supports the notion that our never-ending search to completely understand these powerful climate and weather events will remain somewhat elusive," said D. James Baker, NOAA Administrator. "The listing commemorates the century's weather for its intensity, scope and impact, but it is by no means an exhaustive list." From cyclones to tornadoes, NOAA scientists list some of the century's wildest weather. As the lists indicate, the world has been dealt a host of wild weather cards over the past 100 years, but has witnessed in recent time some of the century's most ferocious and destructive events. The climate is changing, the experts said, and pollutants in the upper atmosphere are playing a role in that change. Part II of The Century's Worst Weather will explore how human activity and the effects of global warming are impacting worldwide weather, and what we can expect from those changes in the future. The lists of events also form a historical road map of progress in weather, water and climate forecasting, according to John J. Kelley, Jr., Director of NOAA's National Weather Service. "They are both a reminder of our vulnerability to the atmosphere and a testatment to the [forecasting] advances we have made," he said. "These events are the big ones that have helped shaped America's relationship with the atmosphere, and have helped further our understanding of Mother Nature." Part III of the Century's Worst Weather will examine some of the advancements in forecasting that weather experts have made over the past 100 years. Drought and famine in China in 1907, toll estimated at 24 million. Millions dead in other drought-related famines in 1928-30, 1936 and 1941-42. Drought in the Ukraine and Volga region of the Soviet Union in 1921-22, deaths estimated at 250,000 to 5 million. Indian drought of 1965-67, estimates of dead at 1.5 million. In 1900, drought in India blamed for 250,000 to 3 million deaths. Yangtze River flood, China, 1931, 3.7 million killed due to flooding and subsequent disease and starvation. Sahel drought in Africa in 1972-75, with estimates of dead at 600,000. 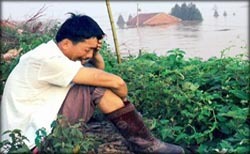 Yearly monsoons swell China's Yangtzee River, causing severe flooding that destroys homes and lives. Bangladesh cyclone in 1970, with 300,000 to 500,000 dead in wind and storm surge. Bangladesh cyclone in 1991, with 138,000 killed. Flooding in Vietnam in 1971, with 100,000 killed. The floods of Hurricane Mitch swamped four countries in Central America, killing about 11,000 people. 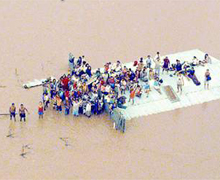 Hurricane Mitch in Central America in 1998, with an estimated 11,000 dead, the region's greatest hurricane loss since 1780. Great Iran flood in 1954, with more than 10,000 dead. Typhoon Thelma in 1991 in the Philippines, with 6,000 fatalities. Typhoon Vera in Japan in 1958, with 5,000 dead. Great Smog of London in 1952, 4,000 deaths linked to the smog, that many others to related causes. Iran blizzard of 1972, with about 4,000 people dead. Violent winter storms along the coasts of northern Europe, including the Netherlands and United Kingdom, in 1965, with 2,000 lives lost. 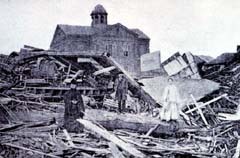 Galveston Hurricane, 1900, a 20-foot storm surge swept over Galveston Island and killed an estimated 8,000 people, the deadliest natural disaster in U.S. history. Powerful winds and storm surge from the Galveston Hurricane flattened buildings across the Texas island. Dust Bowl of the 1930s, when drought swept the Great Plains and plunged thousands into poverty as farmers abandoned their land to seek better lives elsewhere. Tornado outbreak in 1974, when 148 tornadoes swept through the country from the Great Lakes to Alabama and Mississippi and killed 315 people. Hurricane Camille in 1969 claimed 256 lives. Great Midwest Flood of 1993, the costliest flood in U.S. history, claimed 48 lives and caused $18 billion in damage. El Nino episodes of 1982-83 and 1997-98 caused storms that battered the West Coast and set rainfall records in the Southeast. Hurricane Andrew in 1992, which caused 23 deaths and $25 billion in damage in Florida and Louisiana. 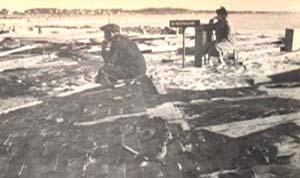 A New England husband and wife look out over their leveled home and community after the 1938 hurricane. New England hurricane in 1938, with 600 fatalities and millions in damage from New York to Boston. Winter superstorm of 1993, which battered the eastern seaboard and claimed 79 lives. Tristate tornado of 1925, which killed 695 in Missouri, Illinois and Indiana. 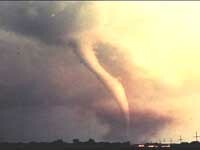 Oklahoma-Kansas tornado outbreak in 1999, with more than 44 dead. Great Okeechobee flood and hurricane in 1928, which killed 1,836. Storm of the Century, 1950, brought snow and hurricane-force winds to 22 states and claimed 383 lives. Florida Keys Hurricane, also known as the Labor Day Hurricane, killed more than 400 in 1935. New England blizzard of 1978 paralyzed New England for a week. When the floods approach, like clockwork Vietnamese families string their most valuable possessions by ropes and stow stacks of rice seed — intended for the winter crop plantings — in the rafters. Then they brace for the worst. During good years, the waters reach to just past their ankles. In bad years, their flimsy bamboo homes are washed away and their rice paddy fields are destroyed. Whatever the damage, the Vietnamese have learned to wring themselves out and start over, year after year. But following some of the worst flooding to hit the country in the 20th Century last November and December, Vietnam's top leaders are determined to find new ways to deal with the floods. "We need to find ways to coexist in harmony with floods and minimize the impacts of natural disasters," Foreign Minister Nguyen Manh Cam said as he pleaded with international donors for long-term disaster assistance during an annual meeting last December. Indeed, in Vietnam and around the world, governments and relief organizations are searching for ways to "coexist in harmnony" with nature. But with each staggering death toll after increasingly catastrophic disasters, evidence mounts that the intensity and frequency of natural disasters will increase in the 21st Century. "There are more people at risk than ever before," said Tom Ross, a meteorologist with the National Climate Data Center. Weather and relief experts blame the unsettling trend on population growth and global climate change. As more and more people crowd into cities or along coasts, the potential for massive death tolls will increase. Further, some experts predict that drastic shifts in the climate could lead to more droughts, floods and hurricanes than ever before. The 1995 earthquake that struck Kobe, Japan, revealed the country's strong vulnerability to its seismic land. Before Vietnam's latest round of flooding, which killed more than 700 people and set back development of Central Vietnam by a decade, the International Federation of Red Cross and Red Crescent Societies (IFRC) had already begun a program to better prepare the Vietnamese for the yearly deluge. The international relief movement provided some 2,450 families with house-strengthening kits. All but one withstood the subsequent flooding. Around the globe, disaster-prone nations have made similar realizations to Vietnam's. In Venezuela, President Hugo Chavez has ordered the demolition of homes in areas devastated by recent mudslides that left as many as 50,000 people dead. To avert another disaster, Chavez will move thousands to the country's sparsely populated interior. In Turkey, where an Aug. 17, 1999, earthquake killed about 17,000 people, contractors have come under intense criticism for building unstable structures in the country's quake-prone industrialized region. More stringent building codes will be used during reconstruction. Between 1990 and 1995, the cities of the developing world grew by 263 million people — the equivalent of another Los Angeles or Shanghai forming every three months, according to a Worldwatch Institutes report. "Population increases in developing-country cities will continue to be the distinguishing demographic trend of the next century," the report stated. 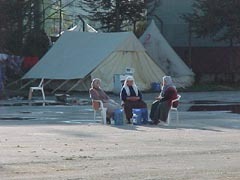 Following an Aug. 17 earthquake, thousands of Turkey's homeless still live outdoors. As a result, natural disasters also will continue to put more and more people at risk. Throughout the 20th Century, and indeed over the past few years, the world saw the devastating effects that natural disasters have on heavily populated areas. From Hurricane Mitch, which, in October of 1998, killed 10,000 people in Central America's poorest slums to the Indian cyclone that hit the coastal state of Orissa last fall, killing some 10,000 people and destroying 1 million homes. "One of the troubling factors is that more and more people are living in less and less space ... Towns and big cities no longer have the space to expand and people are putting their homes in precarious places," said Martin Perret, who has worked for the Red Cross for nearly 25 years. But despite the examples that these disaster-ravaged cities provide, the world's most populated urban centers continue to grow. Tokyo's population skyrocketed from 1.5 million people in 1900 to 28 million people today. The sprawling city sits on a fault line that seismologists warn could rupture at any time. But most of the world's biggest cities are in countries far poorer than Japan, places where people already are living in wretched conditions. "At least 220 million people in cities of the developing world lack clean drinking water, and 420 million do not have access to the simplest latrines," according to Worldwatch. 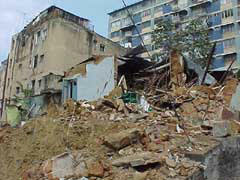 The poor generally live in unstable homes and are forced to crowd into hazardous areas. When a natural or man-made disaster hits, the death toll can be astronomical. Thousands lose their homes and meager belongings, and the poor descend deeper into poverty. Overpopulated cities are becoming bigger targets for natural disasters. Could Climate Change Trigger Even More Disasters? By the third decade of the 21st Century global climate change will become increasingly obvious and ominous. In China, people will begin to notice that the winters have grown warmer. Increased rainfall will deliver even more flooding in coastal provinces and inland droughts will lead to more famines, according to the Global Scenario Group, an international consortium addressing long-range environmental and development possibilities. It's a grim outlook for the country that lost more lives to natural disasters than any other nation during the 20th Century. In the 1900s, China, the most populated country in the world, also had the most deadly disasters — a drought-related famine took the lives of more than 30 million people and a Yangtze River flood resulted in 3.7 million deaths from disease, starvation and drowning in the summer of 1931. In China and around the globe, the next 1,000 years may only get worse, according to some meteorologists. Without action to cut greenhouse gas emissions, the climate of the coming millennium will get warmer, and average global temperatures may rise 10 degrees Fahrenheit by 2200. However, immediate action to halt global warming could result in an increase of no more than 3 degrees Fahrenheit, according to the Environmental Defense Fund (EDF). Experts have warned that climate change could result in massive droughts, famines and floods throughout the world. But without a clear vision of what the human race will do to stop global warming, meteorologists and environmentalists say that the future looks questionable. "Humanity is creating a new climate for the new millennium. Once this climate change occurs, there's no going back," said Dr. Michael Oppenheimer, EDF chief scientist. "Actions taken now to cut greenhouse-gas pollution will determine if adjustment to future climate will be manageable or impossible." 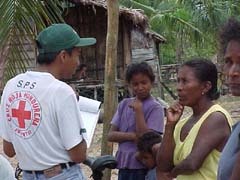 The Red Cross helps disaster-prone regions throughout the world prepare for natural disasters. The world has limited time to act, experts say. Climate now is changing faster than ever, said D. James Baker, who heads the National Oceanic and Atmospheric Administration (NOAA). Global temperatures for 1999 were expected to finish the year as the second warmest year on record since 1900, NOAA said. "The new data, the modeling results, and what we know about how the system works is even stronger in pointing toward the fact that we are seeing global warming and it is part of the overall climate change" Baker said. Global warming has increased disease across the planet, the association was told yesterday. Prof David Pimentel said that global warming would create a favourable climate for disease-causing organisms and food-plant pests and "a much more challenging planet for humans struggling to survive". Prof Pimentel, an ecologist at Cornell University said: "Right now the evidence of significant global climate change is minimal, but there are already noticeable increases in human diseases worldwide. We're seeing the first signs that global climate change can influence the incidences of human disease. This change, combined with population growth and environmental degradation, will probably intensify world malnutrition and increases in other diseases as well." He pointed to various ominous trends: Today, infectious disease causes about 37 per cent of all deaths worldwide, but the estimated number of deaths due to a variety of environmental factors is higher and still growing. Environmental diseases were attributed especially to organic and chemical pollutants, including smoke from various sources such tobacco and wood fuels. Prof Pimentel said more than three billion people are malnourished, the most ever, and that number increases every year. Malnutrition increases susceptibility to infectious and environmental diseases, such as diarrhoea and pollution-related illnesses. The projected increase in population in the next 50 years will exacerbate the spread of disease globally. Densely crowded urban environments, especially those without adequate sanitation and nutrition, should cause great concern because they are sources of disease epidemics, including dengue fever, spread by the Aedes aegypti mosquito. Global warming would encourage this mosquito and others to spread north from the tropics, transporting dengue and other diseases. Waterborne diseases, which already account for nine out of 10 deaths from infectious disease in developing countries, will become more prevalent in a warmer, more polluted and crowded planet. For example, only eight of India's 3,120 towns and cities have full waste water treatment facilities. Air pollutants adversely affect the health of more than four billion people worldwide, and air quality in many places is getting worse. The number of cars worldwide is growing about at a rate three times faster than the world population. Meanwhile, an expanding world population is burning more fossil fuels for both domestic and industrial purposes. About four billion people in developing countries who cook with wood and coal over open fires suffer continuous exposure to smoke. Wood smoke is estimated to cause the death of four million children a year. 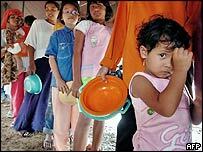 Malnourished people are increasingly susceptible to infectious and environmental diseases. Increasing global climate change will result in a net loss of food. Prof Pimentel said: "Although there may be some benefits in crop production from warmer climates, these beneficial effects will be more than offset by the projected decline in rainfall in critical crop-growing regions like the American corn belt." Crop losses from pest insects, plant diseases and weeds will increase in a warmer climate, Prof Pimentel suggested. Insect pests, plant pathogens and weeds already cause the loss of more than 40 per cent of the world's food, despite the application of �5 billion of pesticides each year. At least 2.5 billion people have been affected by natural disasters over the past 10 years - an increase of 60% over the previous decade, the UN says. More than 478,000 people were killed by disasters such as earthquakes, floods and hurricanes, from 1994 to 2003. The most vulnerable people are those living in developing nations, it says.